Once upon a time in Lethbridge, there were beets. Sugar beets. And guess what, they’re still here! The sugar beet industry has shaped southern Alberta from day one. 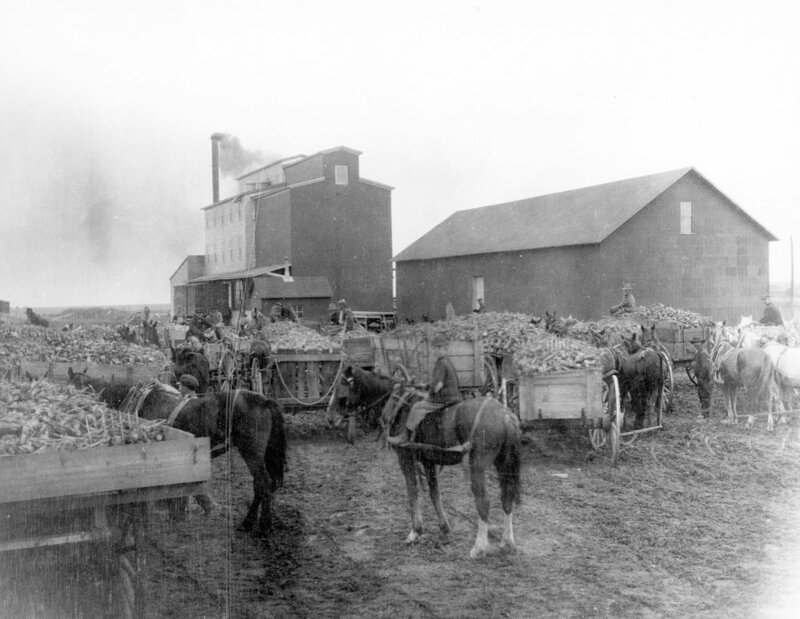 The Galt Archives even has a photo from Southern Alberta's first sugar beet harvest in 1902 (below). That same year the first Albertan sugar beet company was born; the Knight Sugar Factory, located in Raymond. This was only three years before Alberta officially became a province. We’ve been sugar beet growers longer than we’ve been Albertans! Raymond Sugar Beet and Flour Milling Industries, 1902. However, despite its early beginnings, beet sugar was not an immediate success. 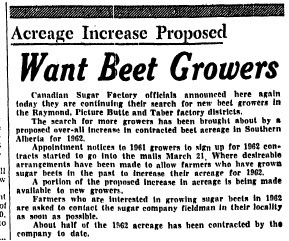 An article in the Lethbridge Herald dated September 30th, 1950, says that there used to be a prejudice against beet sugar. Despite the fact that both cane sugar and beet sugar are essentially the same product – sucrose – beet sugar was not initially accepted in southern Alberta grocery stores. As a result, most of the sugar was shipped to Winnipeg. Meanwhile, wheat was growing and selling very well. Wheat did not require such an expensive process of refinement as sugar beets did (boilers, for example). Also, sugar beets were quite labour intensive, and workers were not an abundant resource at the time. For the farmers, it was just much easier to grow wheat. Consequently, in 1914, the Knight Sugar Factory ended its “pioneer business venture”. Ten years later, in 1924, sugar beets began to regain popularity. After the war, the proceeds from wheat had decreased, while irrigation techniques had been much improved. This provided a perfect window for sugar beets. An idle factory from Idaho was dismantled and set up in Raymond the next year under the governance of the Utah-Idaho Sugar Company. But, would you believe it, the next two years turned out to be “terribly discouraging”. The weather was far colder than usual, and many beets froze, which caused them to go bad faster than they could process them. However, despite a rough start, the venture turned out to be a huge success. The entire produce those first few years was easily sold in Alberta and gobbled right up. It was a much different reception than the first time around. The Alberta Sugar Beet Growers’ Association emerged that year, and with it the co-operation between the farmers and the sugar company proceeded without a hitch. In 1930 things were going so well that they expanded with a second factory, so that they could handle 120,000 tons of beets. This, unfortunately, coincided with another cold summer. The company took a big hit. This summer also marked the year when the Great Depression began to take its toll in Canada. As a result the Utah-Idaho Sugar Company decided to drop their Canadian enterprise. The factory was eventually bought by B.C. Sugar Refining Co. Ltd., directed by Ernest T. Rogers (i. e. Rogers Sugar, ring any bells?). This company had previously only produced cane sugar, and there was a great apprehension amongst the Albertan farmers that the owners meant to shut the factory down. Happily, this wasn’t the case. The Utah-Idaho Sugar Company made the sale on the condition that the factory be run for a certain amount of years after purchase. The company became successful again, and grew steadily. It was soon time to build a third factory in 1936, located in Picture Butte. During World War II, when the Canadian government provided incentives to maximize the production, Alberta produced the largest amount of sugar beets it has ever produced to date. B.C. Sugar Refining Co. Ltd.’s fourth factory was built in 1949 in Taber. It still runs today. Since then, the sugar beet has been an ever present industry to our farmers (except in 1985 when farmers and owners could not agree on a selling price which resulted in no beet sugar that year, just like the NHL this season). Alberta’s weather can be a little on the cooler side, with shorter growing seasons, which creates a smaller beet. However, because we can have long hours of direct sunlight, our beets tend to have an “unusually high sugar concentration” which is why we are still successful in growing them. The sugar beet industry has left an important mark on Southern Alberta’s history. There are over 300 farmers involved in growing sugar beets in Alberta. It has been around for exactly 110 years, despite many weather hardships. It takes strength to be dependent on something so unreliable as the weather. But patience in the bad years and hard work in the good ones has created a rare Canadian industry that has stood the test of time. And the result benefits us all; the farmers, the business owners, and the consumers. I found numerous articles in the online Lethbridge Herald database (throughout the entire history of the paper) about the sugar beets industry, which gave me the information to write this article. You can gain access to this valuable resource by visiting us here at The Galt Archives. Steffi Reynolds is a third-year English major at the University of Lethbridge whose passion is stories; reading stories, hearing stories and telling stories to others. This fall she is the archives assistant social media contributor for the Galt Museum & Archives, earning Applied Studies credit while sharing some of the stories uncovered in the Archives. The March 30, 1962 Lethbridge Herald article that inspired this article.